You need to have something like above but no mark on it and all sticks are attached at one point and they do not have to have same lengths. You may think each stick as a line and they are sticked at one point for simplicity but it is still foldable so you can measure lengths by folding the rulers. Then By folding the ruler, you are supposed to measure every cm from 1 to 40. 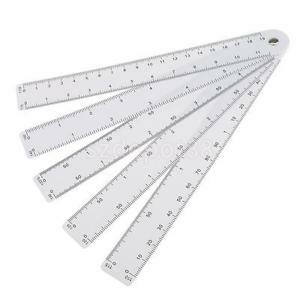 What is the shortest stick length originally you need to have to measure every cm from $1$ to $40$ for this foldable ruler? As far as I can tell, this seems to yield all the integers between 1 and 40. We can include $n$ stick lengths from 1 to $n$, and then select one stick length of length $40-n$. At the very least, this will provide an upper bound. 1-10 using exactly those sticks; 11-19 using 10 + (1 through 9); 20-29 using 30 - (1 through 10); 30 using exactly that stick; and 31-40 using 30 + (1 through 10). Where's that book you want?